Thanks to generous donations from Mountain Buggy and Wildbird this month, we’ve added three new carriers to our lending libraries! Mountain Buggy sent us their new Juno carrier. This versatile soft-structured carrier can be used in many positions including, front facing out, front facing in, and a back carry. It has a unique magnetic locking chest clip and a fabric waist band. They also sent us their infant insert to be used for smaller babies. 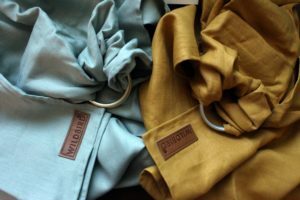 From Wildbird, we have both a single-layer linen ring sling and a double-layer linen ring sling. Linen is supportive, cool, and great for all ages. These carriers will travel to both April meetings before landing in their assigned lending libraries. Come check them out! And thank you so much to Mountain Buggy and Wildbird for your support!